Solid waste management (SWM) in Hansi demands urgent attention in light of the lack of political will in addressing this issue. Despite the incumbent central and state government’s incessant push on ‘Swachh Bharat Abhiyan’, and despite funds being allocated for SWM in Hansi, the condition of solid waste disposal continues to worsen in Hansi. An alarming 50 tons of waste (equivalent to 10 elephants!) is generated every day in Hansi, by a population of approximately 100,000 people. This includes wet waste (30 tons), dry waste (15 tons), domestic hazardous material (5 tons), dry recyclables as well as dry non-recyclables (7.5 tons each). The waste is dumped in drains, in parks, on streets, on empty plots of land – essentially anywhere and everywhere – and has been piling up over the course of many years. On the occasion of Gandhi Jayanti, Bhajan Global Impact Foundation set out on the path of Mahatma Gandhi to mobilise people to take ownership of both the challenge and the solution. BGIF invited the people of Hansi to participate in the Hansi Swachhata Andolan – and the results were dumbfounding. 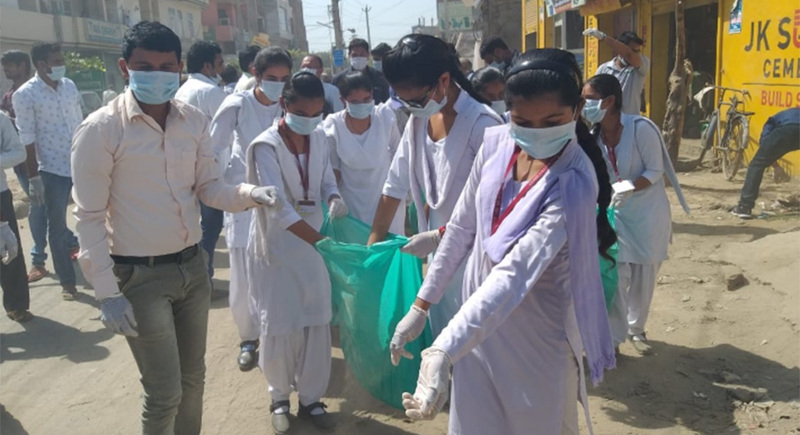 On 2 October 2018, more than 500 people, including girls, boys, shopkeepers, local residents, solid waste management (SWM) experts, and local government officials – as ​Swachhata Senanis​ – raised their hands in oath, admitting responsibility of being part of the SWM challenge and committing to cleaning up their town – their home. Young girls and boys – as Swachhata Captains – at the forefront of this movement, pledged to consciously dispose of waste in a segregated manner, and spread awareness about sustainable SWM in their communities. They, along with BGIF volunteers, went door-to-door in the neighbourhoods, inviting people to join the movement, and shared essential information about environmentally desirable ways of SWM. BGIF decided to set off at Ambedkar Chowk in Hansi, as a tribute to a leader who struggled to bring justice to marginalised communities typically associated with manual scavenging. This was followed by an address by Mrs. Renuka Bishnoi, MLA of Hansi, who shared with the volunteers the value of managing solid waste in a sustainable, inclusive, and ethical manner. Teams were deployed to the designated areas, where garbage had been dumped and had been accumulating for years on end. The task was harder than we had imagined at first. The Swachhata Senanis tirelessly walked through the streets of Hansi, picking up every last morsel of waste along their way. Volunteers were able to empathise with the safai karamcharis (or sweepers) who perform the arduous task of picking waste on a daily basis. Moving forward, they promised to bear their burden of the responsibility by reducing, reusing, and recycling waste, and by spreading awareness about their learnings from this campaign. 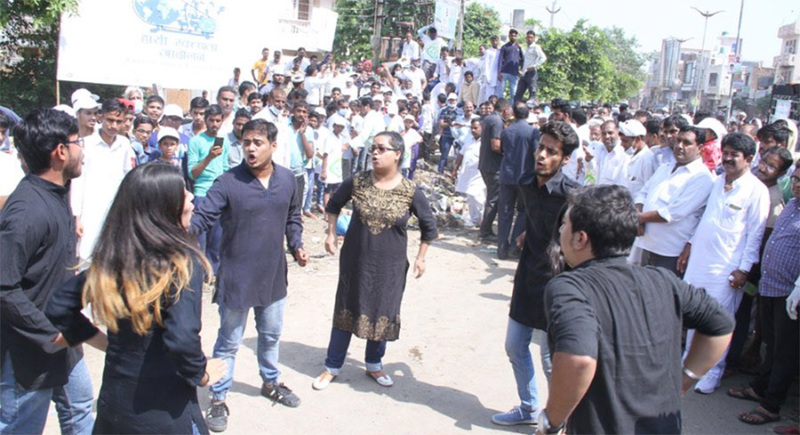 The Jazba Theatre Group from Delhi University added an interactive and fun element to the clean-up movement, as they performed a powerful street play on the importance of keeping our environment clean. BGIF is committed to creating a sustainable impact on the way solid waste is collected, processed, and managed in Hansi. We hope to present Hansi as a success story in sustainable SWM, with the help of partners such as Global Citizen India and Chintan, to those willing to work towards environmental conservation. At the heart of our endeavour is community engagement, in encouraging the local community to take ownership of both the problem and the solution. We would like to thank NDTV 24×7 for acknowledging BGIF’s efforts in SWM during their annual programme, ‘Cleanathon’.